Stretch is not your ordinary ride-sharing service. 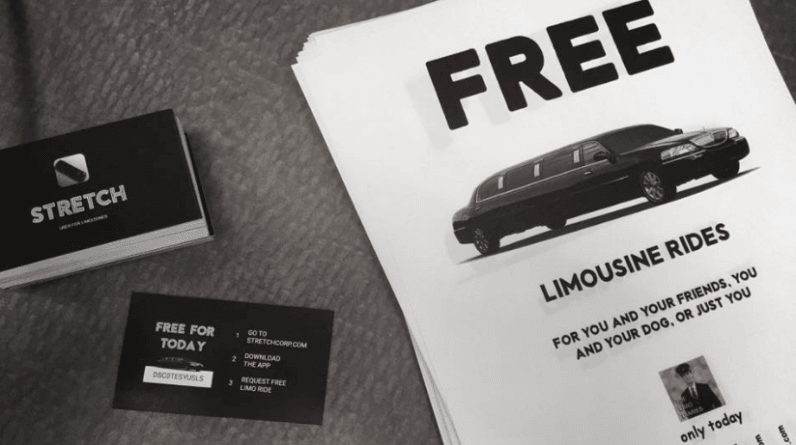 It is a bit like Uber – except that it offers rides in limousines entirely free of charge. But here’s the catch: Unlike Uber, Stretch has only one car available and it could be literally anywhere in the United States at this moment. The unusual app was co-founded by friends James Potter and Bart Proost earlier this year, when the two set out on a quest to become the first people to visit all 48 contiguous states voyaging around in a 28-foot vintage limo. Having previously worked as a mobile developer, James decided to build a “half-baked app for the occasion” so the traveling duo could share their roadtrip adventures with nearby strangers. The idea of Stretch is fairly straightforward. The app lets you follow the vehicle along as James and Bart drive around the US, and if the limo happens to be in your vicinity you can request to be picked up. Just don’t expect the drivers to take you to your desired destination. As the co-founders explain, riders will be dropped off where they were initially picked up. Since first embarking on this epic roadtrip, James and Bart have made stops in Massachusetts, New York and Illinois. The two are currently docked in Portland, but you can expect their limo to roll in Seattle, Portland and San Francisco over the next few days – so give them a shout if you spot them near you. Download Stretch from Google Play or the App Store to see where James and Bart are currently cruising around – and like their Facebook page here for more updates from their cross-state limo adventures.